Golfing has been a passion of mine my entire adult life. Getting out on the links for me is about more than just a sport. While the competition and individual challenges of the game are what lured me to it in the first place, the peace of being outdoors on a beautiful course is what keeps me coming back. But it is not always a placid time for me. A while back I started feeling aches and pains in my back from lugging my bags across the course which, in turn, adversely affected my swing. I don’t always have a caddy so this became a problem for me. That is why I am so enthusiastic about the FTR CaddyTrek Golf Cart. It has taken a load off my mind and body both literally and figuratively. Now I can just concentrate on my game. Anyone who is an avid golfer should really look into the FTR CaddyTrek Robotic Golf Cart. This has been so helpful to me as a regular golfer. I no longer have to strain myself in order to get my gear from one hole to another and I am a lot less tired overall which means I can play for longer. Many golfers I know have also benefited from the convenience and assistance of this amazing electric golf caddy. The reason this has become such an important tool for me is because it handles all of the grunt work for me. First of all it has ample storage to fit all of my clubs and bags. When I am walking from hole to hole, I don’t have to carry anything in my hands. The various modes are convenient too. I can set it to follow mode and it automatically tracks my movements and stays a good distance behind me. For when I want it to get to the next hole before me I just set it to marching mode and it is ready to go before I even arrive. Again my problem was that my heavy bags were starting to take a toll on my body which is another reason why the FTR CaddyTrek Golf Cart works so well for me-it is lightweight. It only weighs 8 pounds and it folds up very easy. I only need to carry it when I am off the course and it fits perfectly in my trunk. One time I used it while it was raining and I was a bit concerned about how it would perform in wet conditions but it performed marvelously. The wheels are large and rugged enough to handle wet terrain so long as you are not playing in the mud. Totally eliminates the need for a caddy or to carry your clubs yourselves. The dual 250 Watt motors run very quietly. It can be controlled remotely or set to run automatically with the marching and following modes. 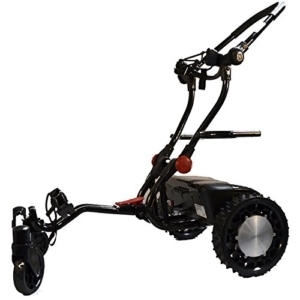 The FTR CaddyTrek R2 is very light and folds down to half its size when it is fully engaged. It is very easy control when you are using the remote mode. On a single charge it can last for up to 27 holes. There is no seat attachment available for this model. Putting the sensor on the back or front of your pants for the follow and march mode is a bit awkward. Sometimes lose connection with the cart after a swing. Has a bit of trouble navigating steep terrains. At the end of the day this is a really nicely designed robotic golf caddy. By handling all my club lugging needs it has allowed me to enjoy the game the way it’s supposed to be and to play it for longer periods of time. I have really enjoyed the hands-free features despite the fact that sometimes I can lose connection with the unit. The loss of connection doesn’t happen enough to outweigh the benefits of using the hands-free modes anyway. While it struggles a bit on inclined terrain, I was amazed with the way it handled itself when it was raining. It may not be able to traverse rivers or climb mountains but I am very pleased with the way it performs in inclement weather. If you love the game of golf and want to enjoy it even more, I highly recommend this product. It has changed the way I play the game. I strongly urge all golfers to give the FTR CaddyTrek R2 a good look.